MEDFORD, Ore. – Interstate 5 was closed for about 15 minutes Monday morning due to a person in distress. The Medford Police Department said around 6:30 a.m., a person climbed over fencing on the Garfield Street overpass and prepared to jump onto the roadway. 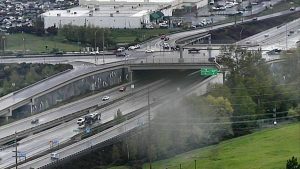 First responders stopped traffic on I-5 as they began a conversation with the individual. The person was eventually talked down and the highway was reopened. If you or someone you know is suffering from depression or having suicidal thoughts call 1(800) 273-8255 or text HELP to 741741.